Tactical MANET Mesh networks have become a key part of the battlefield communications picture, most notably in solving the “Dismounted Situational Awareness” challenge - delivering media and data rich applications as well as video to and from the dismounted soldier. Mesh networks have many advantages over traditional military communications systems, not least in their ease of configuration, ease of deployment and in-built resilience. MANET Mesh networks share some key characteristics: They are self-forming - Mesh radios or “Nodes” automatically connect or “Mesh” with surrounding units. And routing across the network should be seamless without the need for user intervention or setup. In the case of DTC’s Mesh, this is achieved using Dijkstra’s Algorithm - essentially a cost table routing approach, much like that in an automotive Satnav - but in this case based on the signal quality and supportable data rate for each “hop” rather than mileage or drive time. However, there are significant differences between the ways in which this is implemented by different vendors as Garth notes “some Mesh products use a WiFi derived waveform, even in some cases using the same ‘chips’ used in domestic WiFi routers. In our experience, these waveforms, whilst very effective in a domestic environment, where very high data rates at very short ranges are the order of the day - are not well suited to long range links, nor operation in difficult conditions - such as under heavy interference or jamming.” In contrast, DTC employs a proprietary Tactical COFDM mesh waveform designed specifically for long range and robustness in the presence of interference and multipath reflections. Moving away from Wi-Fi and other standards based technologies also has other advantages - in particular it means that DTC can offer numerous different channel bandwidth options to allow an optimum trade-off between data rate and range as well as making the best use of available spectrum. Coded Orthogonal Frequency Division Multiplexing - or COFDM for short - is today widely used in wireless mobile communications systems and for Digital Broadcasting, both Television (DVB-T) and Radio (DAB). It provides significant advantages in terms of robustness and multipath rejection over traditional “single carrier” communications systems. COFDM works by splitting the information to be transmitted over a large number of signals or “carriers,” each transmitting at a very low data rate. These carriers are separated just enough to avoid interfering with each other - this is the “Orthogonal” bit in COFDM. This contrasts with traditional high speed communication links which use a single very high data rate carrier. Garth explains “Traditional single carrier transmissions are like having a super wide bridge crossing a river. 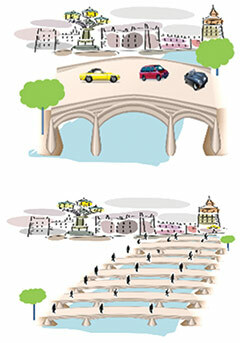 Lots of cars can cross at the same time, so if everything is ok the traffic flow can be very high. But if the bridge has to be closed due to, say cracks being found or a boat crashing into it, then no traffic at all can flow. And COFDM systems can make up for some “bridges being closed” - carriers lost or corrupted- by employing redundant error correction coding - this is the “Coded” in COFDM. DTC recently launched the SOL8SDR-H “Special Role Radio” a Mesh transceiver designed for Soldier-worn Tactical MANET networks. The SDR-H employs standard Military radio batteries and accessories and includes built in dual video encoders, Ethernet, USB and serial ports. ITAR-free and offering AES256 encryption, it also incorporates an inbuilt GPS receiver and provides a full 2 Watts of RF output power, as well as MiMo capability to support increased data rate in a given channel allocation. Other DTC MANET Mesh radios are used in artillery applications, providing Mesh links between Fire Batteries and to the Fire Control Management System (FCMS) to allow for co-ordination of fires. 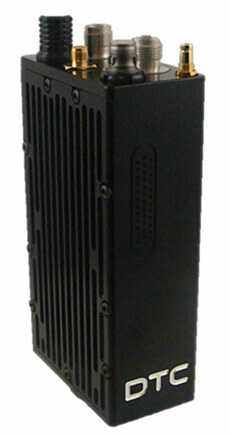 Embedded DTC Mesh radios are also widely used in military UxV systems - on land, sea and in the air.